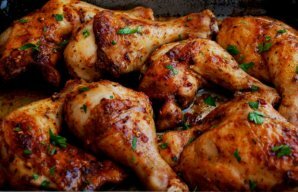 This delicious Portuguese style barbecue beer chicken takes a while to prepare but it is worth it in the end. To make the chilli sauce, place the chillies and garlic in the bowl of a small food processor and process until chillies and peppers are finely chopped. Add the olive oil, lemon juice and salt and process until all is well combined and transfer to a bowl or food container. Prepare your grill, if you are using charcoal, put the coals on one side of the grill, leaving another side free of coals (if you are using a gas grill, fire up only the burners on one side of the BBQ. Rub the chicken all over with the olive oil and pepper sauce you mixed in the processor and leave some sauce for basting later. Now open the beer can and pour some out so the can is only half full. Insert the beer can into the open cavity on the chicken and prepare the grill by setting it from high to medium heat leaving one side off or free of coals to cook with indirect heat. Place the chicken on the cool side of the grill using the bottom of the can and the chickens feet to form a tripod so the chicken can cook upright. Now cover the grill and do not open it for at least one hour. After an hour start basting the chicken with the left over olive and pepper sauce every 10 minutes, do this for about 30 to 40 minutes. Now use a meat thermometer to check the internal temperature of the chicken, you want it to reach 165 degrees in the center. Another way to tell if the chicken is done is just to poke the thigh with a knife and if the liquid runs clears and not pink the chicken is done. 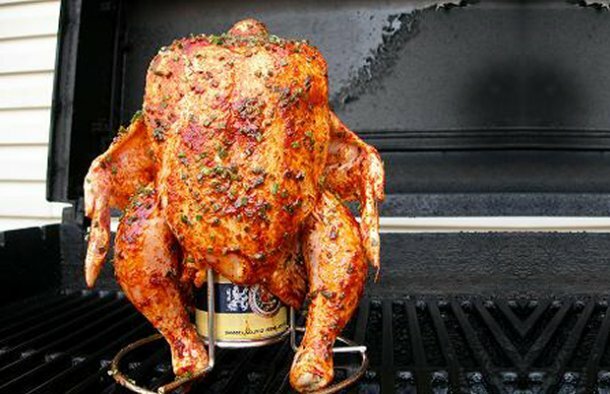 Once the chicken is cooked remove it carefully from the grill because the beer can is very hot. Lay the chicken flat on a serving tray and remove the beer can. 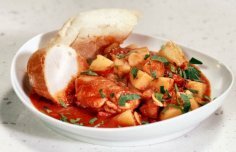 How to make Portuguese one pot chicken and potatoes. Serve these delicious Portuguese fried chicken legs with beer (Pernas de frango fritas com cerveja) with fries or white rice. 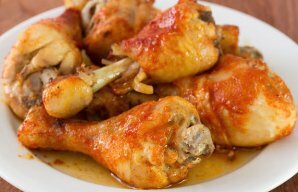 This Portuguese piri piri chicken recipe is an authentic Portuguese dish that will wake up your taste buds.